With more than 20 year's experience in amusing children Clive Chandler specialises in entertaining & educational productions that meet the needs of Primary Schools. His re-telling of traditional tales suits staff seeking that extra lift to literacy work, and proves popular with all those looking for a bit of fun. 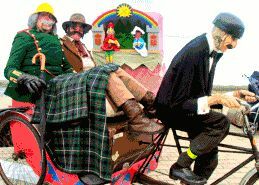 Performances are available throughout the year, so you can book Clive with the puppets for any day that suits you. Watch Clive Chandler chat with his audience before the show and you realise that here is someone with a deal of experience in handling children and adults. He knows just what amuses, just how to raise a smile. 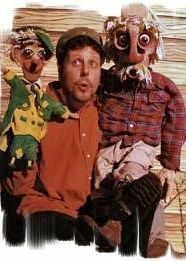 And Clive manages to add something to the traditional appeal of the children's entertainer, his puppets reveal a gentle wit and whimsy and a touch of the unexpected. Even with a familiar tale there is usually a surprise around the corner. Clive has shows suitable for theatres, but also specialises in school and library performances. He can work outdoors and has much experience in mounting shows and festivals in shopping centres. All his shows last for around 45 mins each. His Punch & Judy Show comes with sound and simple lighting. Peddling a bespoke brand of humour.